The pulsing red crystal at the dark heart of this trap glows with an eerie light, attracting mystic mice like moths to a flame. Any mouse attuned or interested in arcane energies and secrets will find this trap positively irresistible and will pursue it to their doom! The Shattered Arcanum Trap Skin can be used on the Grand Arcanum Trap. The trap's stats (power, power bonus, attraction bonus, etc.) are not changed. The Shattered Arcanum Trap Skin can be found in Relic Hunter Treasure Chests beginning with Season 3 and can be traded on the Marketplace or through Give To Friends. 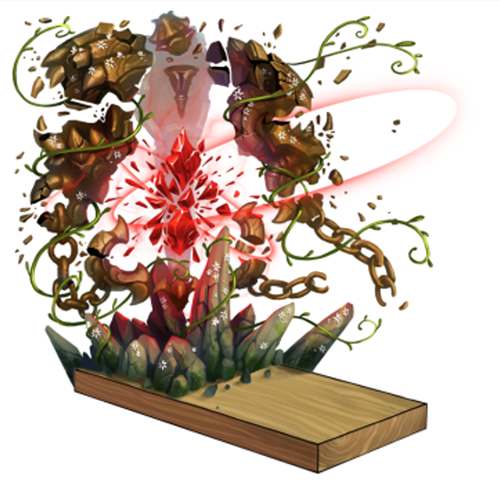 23 June 2015: The Shattered Arcanum Trap Skin was introduced as a reward within Season 3 Relic Hunter Treasure Chests. This page was last edited on 9 December 2017, at 14:54.